Oh how I love silk! I love the sheen. There’s nothing like it in other fabrics. Silk can take on the boldest, strongest colors and hold them fast and never let go. I love the “hand” – how silk feels when you scrunch it up in your hand. It even makes a crunchy sound as a sewing machine needle punches through it. Silk appeals to all your senses. And now, I love painting on silk. This is not the last project where I’ll stencil on silk, that’s for sure. This is the cushion in a closet nook that I converted into an exotic reading nook. 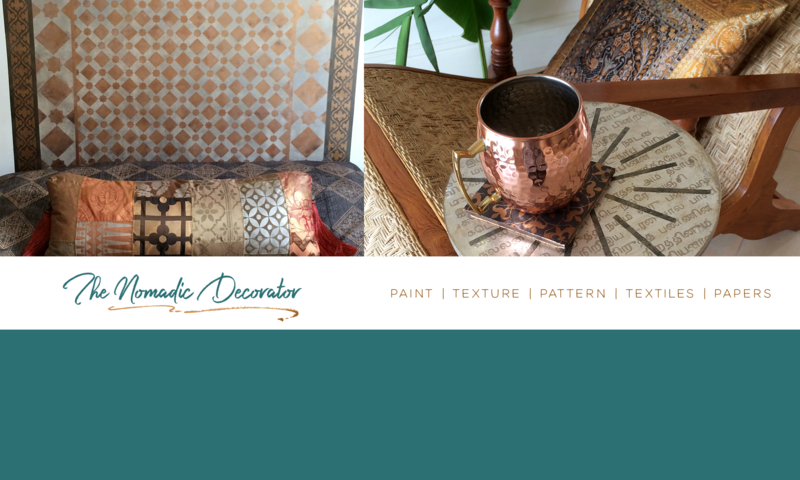 I wrote previously about the stenciled bench front below the cushion. And now for the “how-to” for the cushion stenciling, you can find my tips about stenciling on silk at my post about this cushion at Paint and Pattern blogzine. 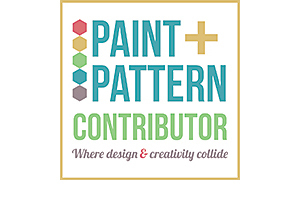 Paint and Pattern is a fun, creative, inspirational website run by the company that creates these gorgeous stencils I use a lot, Royal Design Studio. 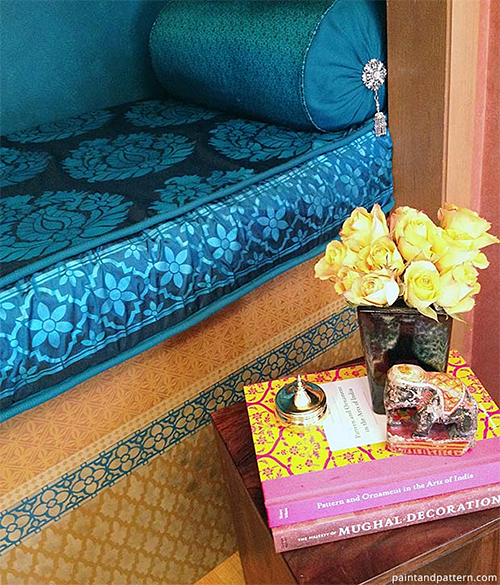 The stencils used here are new India-inspired stencils that Royal Design Studio created: Taj Tile Border along the edge of the cushion, and the elegant Rani Paisley Damask stencil on the top of the cushion. The paint is their Stencil Creme formulated specifically for stenciling (and it’s great for other painting too). The cremes make a perfect crisp edge with the stencils, and they have a slight metallic sheen that looks great on silk. 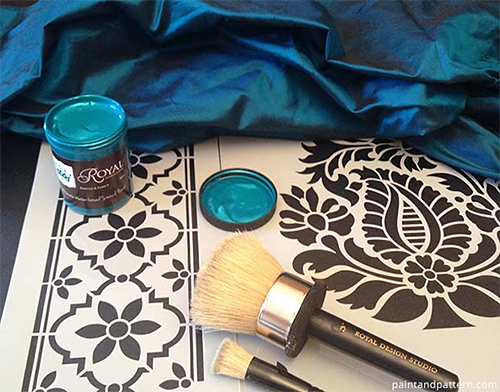 If you want to stencil on silk, I highly recommend these stencil cremes. 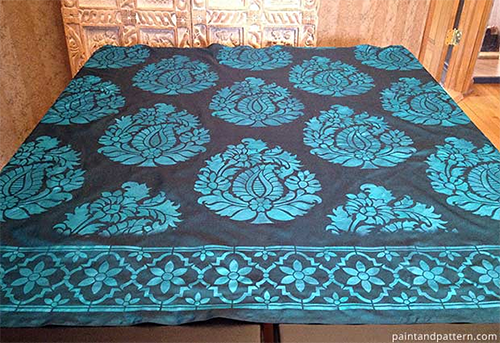 A paint that would dry matte like an acrylic or fabric paints wouldn’t look quite right on the sheen of silk. But as you can see in the photos, the stencil creme has an iridescence that matches the silk. The cushion is made of a teal color silk dupioni that I found at Nalli sari shop in the Malleswaram shopping district in Bengaluru last year. I like to buy raw materials like fabrics while traveling, then turn them into my own unique souvenir when I get home, like a pillow or a skirt, or a bigger ambitious project like this seat cushion. This piece of silk is also special to me because I found it during my first foray out and about an Indian city by myself. I was on my own wandering around the whole day, and it was a very freeing experience. Malleswaram has a huge mall with many American brands – Mantri Square – where most travelers will find refuge and great shopping therapy. But honestly I preferred to walk around the streets and their mish-mash of tiny local shops. I started the day in Mantri Square but was quickly itching to get out of there and into the streets. I did not worry about anything, as I’d already been to India three (maybe four? forgetting now) times before that trip, and felt comfortable enough to deal with the challenges. Such as, to deal with crossing road traffic safely, I walked behind other people who knew what they were doing and used them as shields! No harm done! I liked the Malleswaram neighborhood because my husband is Tamil from Chennai and Malleswaram is a neighborhood of Tamilians in Bangalore so the whole neighborhood felt familiar. Just seeing familiar things was comforting. The streets are shaded by towering trees so the temperature was comfortable too. 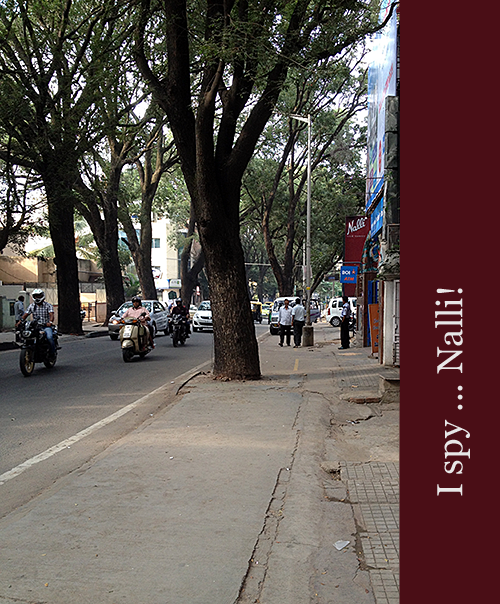 I was thrilled to be wandering up a street and saw way up ahead, the familiar “Nalli” sign I know so well from Chennai! 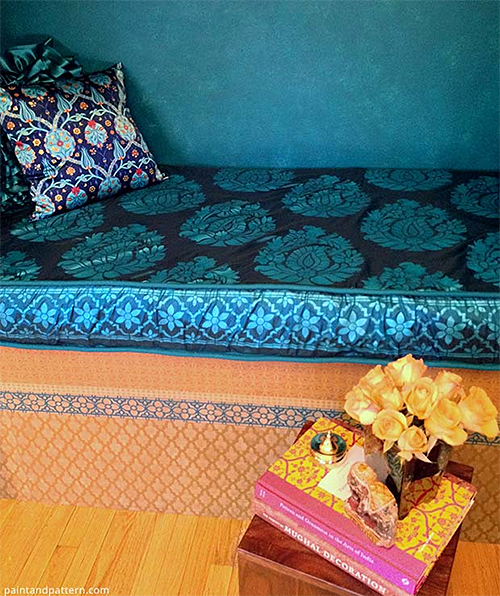 And there I found the silk dupioni in the perfect shade of teal for the nook cushion! Anyway, just looking at this silk makes me remember all of that. 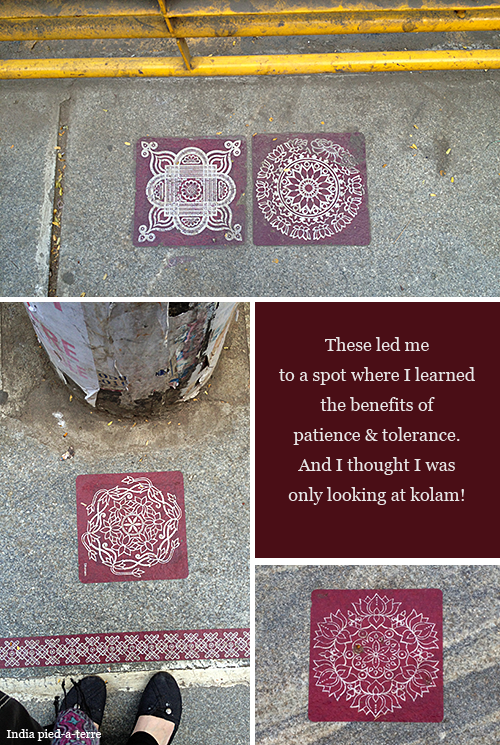 And the fun conversation with a young lady who was selling kolam designs from her sidewalk blanket. She had plastered the sidewalk with samples as advertisements, leading you right to her blanket. People in India might ask you very personal questions pretty quickly, and years ago I would get annoyed because in U.S. culture you don’t ask people you just met such intensely personal questions, but now I just let that go while in India and run with it. And of course she asked me questions, and we wound up laughing and having a great time chatting, and a great big familiar hug good-bye. There’s a lesson there! 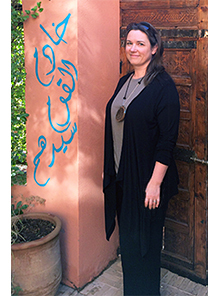 I think it’s all in how you respond to it, and when traveling you can learn so much by letting go of hang-ups. Yes, there is a lot to remember in a piece of simple but special silk. And now it’s a part of a special corner of my home.